Did anyone need to cook it longer than 40 min? It’s been a long time since I’ve made the cake, Lisa, so hopefully people who’ve had recent experience with it will weigh in. I’m glad you ended up liking it. I made this today and it’s awesome! Got to eat it warm and it’s heavenly. I’m going to make another one for tomorrow. I hope it’s as yummy after sitting overnight. But if you slather enough butter on top while it’s still warm I’m guessing it still tastes pretty good! Made this cake for today’s labor day picnic and it is delicious! My husband alone had 3 pieces! He leaned over and said “this recipe’s a keeper”. Thanks for posting it! Sandy, I’m so happy to see this. This simple little cake is the winningest thing I’ve ever found and I wish I had a million more recipes like it. People love it. Thanks so much for coming back to comment! This one’s a never-fail – glad you like it. Can you make it without sour cream? I am not a fan but I don’t want to mess up the recipe? Come give us a report on how it turns out! I ‘ve been making this for years, but my recipe calls for a cup of raisins that I mix with the cinnamon and brown sugar before adding to the cake. I’m not a fan of raisins in cookies, but they sound like a good addition to this cake. Should I grease the pan?? Not sure if I commented before, oh well! Lol. Just finished making 2 of these delicious cakes for tomorrow’s Christmas dinner! Everyone always enjoys it. Thanks for the recipe!! Glad that worked out, Felicia! I made this for Thanksgiving everyone loved it! I’ve been requested to make 3 for Christmas! Awesome. Had some at a gathering and had to get the recipe. Just made it for the first time. Thank you for sharing!! This cake turned out awesome! I had some issues with layering and swirling, but it stilled looked okay after baking. Everyone loves it! Going to tailgate with it today!!! So delicious and easy, my children LOVE it!! WOW, it’s good and SO SIMPLE to make. Once the first person tries at the potluck, the word will spread and it’ll be gone instantly. Thank you Judy and thank you Pinterest for leading me to this recipe. Made it, it was wonderful right out of the oven! Still awesome the next day cold with a cup of coffee. Took some to work and received several compliments. Thanks for sharing. Let us know how it turns out, Shirley. This recipe sounds really good. I’m just wondering does the sour cream have to go in it? Is there a substitute? One of my FAVORITE recipes from Pinterest! My family loves this cake. I have made is so many times. Making it again this week! 🙂 Thanks for posting. I hope i didn’t mess up . Put some brown surger in with cake mix and sour cream mix before i relized what i wad doing . SOOOO many comments on this cake…..TOP NOTCH!! I’ve made about 10 in 2 weeks! They love it! That’s so cool. This is my all-time most-popular post – wish I had another recipe as perfect! Thanks for responding to my question Judy, I’m makin’ this in the morning! Can this site over night.. I want to make it for breakfast foe a work meeting. Or should I make it in the am? Most likely it wouldn’t be a problem, but because of the eggs and sour cream be sure to refrigerate it. I have 5 white cake mixes my husband keeps buying but no yellow. How do you think that will work? I think it will work just fine. Add a drop or two of food coloring if it looks anemic. Good to know. I consider it light-years beyond the packaged honeybuns of my youth. Sinfully perfect. I’m making this right now. Smells so good. I won’t be able to try it because I am sending it along with my 13 yearold son to a friends evening that they have every Thursday night. I’ll send concensus tomorrow night. So excited! Thanks for posting. The Son says, “A massive hit. Make it again every day!” He did not return with one piece for me. A friend Gladys was over and now I have to make one for her, too. So guess what I will be doing tomorrow! Thanks again! Still making this cake 3 years later! Wonderful. People think it is an old family recipe. One of the best cakes ever. Thank you, again! So good of you to come back and let me know, Susan, and I’m sorry to have been out of the loop for a bit. I think this must be the world’s winningest recipe! Awesome cake ! one of those you can mix together before the oven is even heated up!!!! Does the brown sugar need to be packed? have you tried nuts in this recipe? No, but go for it! Walnuts, pecans, or whatever you like. Just make it..taking it to school for poor Friday!! I’m sure they’ll love it!! Is there an alternative for the sour cream? Forgot it at the store yesterday!! McKenzie, in all such cases Google is your friend. I retired my apron and what I do with recipes is read and pass along to my husband who does all the cooking here, Hope your cake turned out well! I’m not a baker and don’t have the patience for it but by golly this is the second time I made this. It lasted me a little over six days and it stayed moist!! I have made this cake 3 times so far. Devoured each time. I am making them as cupcakes today for my surgical technology class. They are in for a treat!!! Just made this. It was AMAZING! Thanks for sharing this. WOULD THIS WORK USING A BUNDT PAN? Do you make the cake mix and add the ingredients or just use the cake mix dry? I’m a newbie at baking! Add the dry cake mix to the ingredients named in the instructional paragraph. I see now that it isn’t clear exactly what they mean. Enjoy, and Merry Christmas! Cake was awesome in fact I am going to make some like 12 and give them for Christmas gifts.Thank you so much for sharing. Great! So glad that worked out. It’s in the oven right now! YUM! Thank you so much for sharing this recipe! I made it for a potluck at work (in which I missed bc I wasn’t feeling well) but it turned out wonderful. I had enough to share a well as plenty for myself due to missing the potluck lol. Ooh, that’s trying new food the hard way! Is this a good cake to cook the night before? If do should I still put the icing on top or wait til the Day of ? Ice it while it’s warm so that the topping is more glaze-like. My husband made this again yesterday and threw in extra cinnamon, brown sugar, and a stick of butter. He took it to the barbershop as a thank-you gift so we didn’t taste any of it, but it looked irresistible. Is this a good breakfast side dish, as cinnamon rolls, or is it more of a dessert? Wanting to serve it with a egg, gravy and biscuit casserole? It’s like eating an old-fashioned honeybun for breakfast, so if that doesn’t sound too heavy with biscuits, anything goes! Can this cake be refrigerated? Holy crap! I just made this last night, it was simple and so freaking delicious. Thanks this recipe is a keeper! looks so delicious; gonna make this weekend. 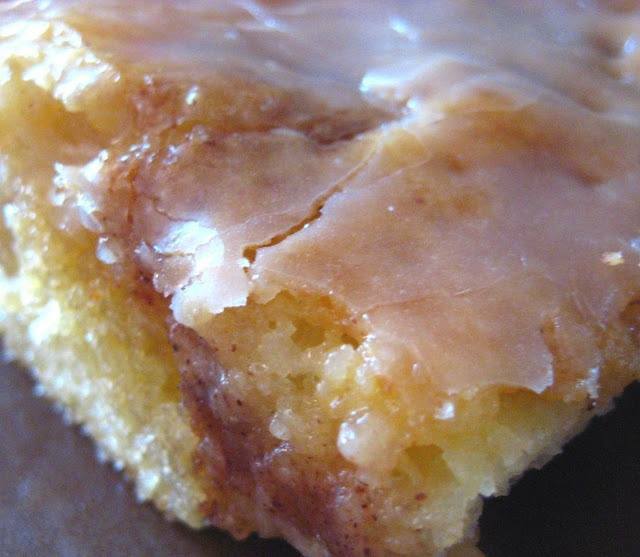 The Honey Bun cake looks delish!